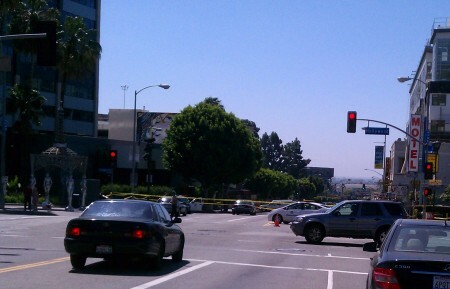 A man was killed and another wounded on La Brea near Hollywood Blvd. early this morning in what police are calling a gang related shooting. The incident occurred at about 3:10AM. 22 year old Lorenzo Smith of South Los Angeles was attending a party near 1645 North La Brea, near Hollywood Blvd., and was pronounced dead at the scene. Another man suffered a gunshot wound to his right hand and was transported to the hospital. Police were still investigating the incident as of noon on Sunday, with a crime scene blocking the stretch of La Brea between Hollywood Blvd and Sunset Blvd. The early suspect description police were initially working with in the minutes following the shooting described him as a black male, 21 to 26 years old, 5’9″ in height 190 pounds, wearing a blue and green collared shirt and jeans. He was said to be armed with a small caliber silver handgun. Details can sometimes change as police learn more about incidents through their investigations. If you have any information about the incident, police are asking that you call 1-877-ASK-LAPD.